Let us not be fooled into complacency or dejection. We may be doing this again with the House, depending on what happens in the Senate today. We must make DC listen or risk losing the country to a program that is already devastating the lives of real people, and will ultimately devastate our nation. The truth of the matter is actually rather simple: Obama-care could be de-funded any time John Boehner decided to find his…voice…and do something concrete that is entirely within his power. The House, led by Speaker Boehner, could initiate the process of sending individual appropriation bills to the Senate, one after the next, for all the essential programs and budget items that would fall under the ordinary budgetary process. Send a defense spending bill. Send a Social Security spending bill, and up the ante by giving a 4% raise in the cost of living adjustment, one time, “to account for the effects of inflation not considered in the CPI”(Consumer Price Index.) Do the same with other big spending programs, but simply withhold one on Obamacare. Dare Harry Reid to hold up the bills, or the President to veto them should they pass the Senate. Go on television and explain why all spending measures must begin in the House, and the House has passed each and every one of these individual things, and throw down the list on the table. Tell seniors: Harry Reid is holding up your Social Security check. Tell soldiers that the President, their commander-in-chief, is preventing them from being paid. Just tell the truth: Because the President and his party are more interested in buying votes than in funding the essential functions of government, the President is willing to see Grandma eating dog-food and soldiers in the field being denied beans and bullets. I predict that with his increasingly tenuous grasp on the support of the American people, Obama would cave. Tie each bill to the debt ceiling. Make it impossible for government to spend more than its receipts. This can all be accomplished if the House of Representatives merely exercises its prevailing constitutional authority over the purse. You might want to know that Obama is probably a good deal more nervous about this than you might guess. This is because government has been illegally borrowing money in excess of the current debt ceiling since early summer. To me, this is an unconscionable circumstance, and part of the reason Boehner is going along is because the President has succeeded in buying his silence through Boehner’s complicity. The US government is already in a sort of insurrection against its own laws. Why do you suppose the debt clock has remained frozen these months, just shy of the legal borrowing limit? Meanwhile, the Federal Reserve is still lending money into existence to somebody. Any rational person can guess the real answer here, and if there isn’t a continuing resolution and a corresponding increase in the debt ceiling soon, Obama and all those assisting him will be in deep…water. There is a conspiracy of silence in Washington DC, and the American people are its first and foremost victim. The truth is that at the current rate of government borrowing, no program is sustainable. It’s now so bad that they’re suspending investments and re-investments of Federal Employee retirement funds. 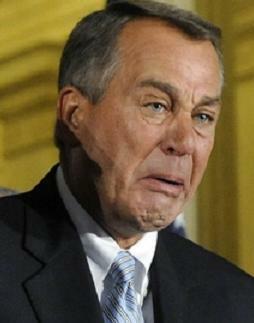 That’s how bad it really is, and it’s the reason that John Boehner isn’t saying a word. It’s the reason nobody really wants to push on de-funding Obama-care, and it’s the reason Washington DC is hoping they’ll pass a continuing resolution to fund the government and this will all just quietly go away… for now. Ladies and gentlemen, you should know that there is no chance whatever that we will succeed in slowing this runaway government unless we lean very heavily on our elected representatives. There’s no chance that as long as stooges like John Cornyn(R-TX) are willing to betray us that we can expect any change in direction. We mustn’t let these rotten liars continue. Yes, it’s as bad as that, and everybody should know it. How many conservatives are aware of what’s been going on with our debt? How many conservatives realize the implications? When and if they re-start that debt clock, you will watch it wind up more quickly than ever, at blinding speed as it lurches to catch up with all the debt the government has illegally accrued in the last several months. 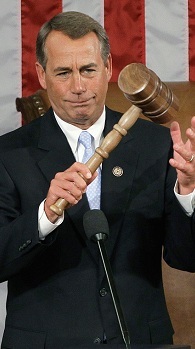 There is treason in Washington DC, and if you want to know why Speaker Boehner will do nothing about it, it’s because he’s in on it too. On Friday will come the vote for cloture on the bill now pending before the Senate. Reid must not succeed, which means you must turn up the volume on all Senators beginning first thing in the morning. If you can fax them, do so. Their fax numbers are listed on the Senate’s website. Just select your state in the upper right-hand corner, and if your own senators are pretty solid, check in with some of the others, including the Minority leader’s(Mitch McConnell of Kentucky) and the Minority Whip’s(John Cornyn of Texas). Also hammer some of the red-state Senators who are up for re-election in 2014. There’s some evidence Senator Manchin of West Virginia is beginning to crack under the pressure. It’s time for maximum effort and maximum exertion from this moment until we win or lose. This will almost certainly move back to the House, in which case we’ll need to get after Boehner and the establishment phalanx there. Let us not squander the momentum and the good start Senators Ted Cruz(R-TX) and Mike Lee(R-UT) have provided. We’re in for one hell of a fight, and our country’s future is at stake. This is no time for hesitation or waffling, and we must demand our elected leaders show the character and fortitude we expect. The country is in real danger now, much worse than the DC class will tell you, and it’s time we let them know that we see what they’ve done, what they’re doing, and what we intend to do about it. Editors note: You will notice on the Senate homepage that there is an article celebrating 100 years of direct election of the Senate, complete with a propagandist puff-piece about the passage of the 17th Amendment. Mark Levin’s book must really be getting to them, since he proposed repealing the 17th. Coincidental? You decide. Early Wednesday, I brought you the story that had erupted in Washington over Republican capitulation on Presidential appointments on Tuesday evening. While Ted Cruz was winning the Republican run-off for Senate in Texas, the House Republican leadership was busy selling us out, but it didn’t end with the matter of Presidential appointments. They also came to an agreement on another temporary spending extension that will carry the budget problems until after the elections by virtue of yet another continuing resolution, as the Heritage Foundation reports. Let’s get real: If we can’t win by standing for the constitution, let’s just quit, surrender the country, and simply lie down and die. This is another example of the preternatural fear exhibited by Republican Congressional leadership over the prospects of a government shutdown. I don’t understand why, because this nation has survived many shutdowns, including at least three major ones during Reagan’s administration, and at least one during Clinton’s. Of course, it is the shutdown of 1995 that leadership fears, because in that instance, Bob Dole over in the Senate undercut Gingrich because Dole was seeking the Presidency in 1996. Now, the leadership is selling-out for Mitt Romney’s sake, but if this continues, we will have a repeat of the 2006 disaster. Somebody should tell Speaker Boehner and Leader McConnell that they don’t answer to Mitt Romney, but more, Mitt Romney should make a case on behalf of budgetary discipline, but just like last summer, Romney didn’t say a word about the deal-making over the Debt Ceiling until it was finished, only then remarking on it. This is precisely the sort of spineless approach I have feared from Mitt Romney, and from any Congress that would work with him. If this is what it will be like in a Romney administration, I’m not interested. More, we shouldn’t get our hopes up too high since it’s now apparent that Boehner and the boys in the House simply don’t have the stomach for a battle. As usual, the GOP establishment is in collusion with liberals to screw the rest of us for the sake of politics. It stifles the economy by adding to the uncertainty among investors and employers, making them reluctant to pursue growth-producing, job-creating activities. It erodes public confidence. Congress’s repeated failure with such routine matters as annual spending bills breeds cynicism about how lawmakers are handling more than $3.5 trillion of the economy’s resources each year. It weakens Congress’s ability to budget at all. Each repetition makes fiscal mismanagement the norm. Past vices become present-day habits, and the chance of Congress restoring stable budgeting practices grows more remote. Without them, Congress will be unable to address the huge entitlement spending challenges that are growing larger and more imminent. More than any of this, however, I believe it simply “kicks the can down the road” again, in search of a more favorable time to address the impending catastrophe. By “more favorable,” they mean a time when there is no impending election, but I have news for these establishment weasels: There’s always an election pending, and this is precisely why we never actually address these issues. Kicking the can down the road is much less painful to politicians, but it does precisely nothing to repair our nation, and it helps to promote an eventual collapse of our system. Congressional Republicans ought to wake the Hell up. Mitt Romney’s campaign didn’t appoint them to office. We elected them. They’re in office to represent our interests, but not Mitt Romney’s electoral aspirations. This is not a winning strategy, but merely a plan for perpetual retreat. We can’t afford this sort of leadership any longer, and if this is what Romney offers, we’re better off without him too.